Just wanted to share some news reports that went out when we were in Malawi from the BBC Scotland news team. At 7pm today we're live on the BBC One Show and will be meeting up with Jamie Oliver and discussing our Malawi trip. Immediately after at 7.30pm on BBC1 Scotland 'Martha, Meals and Malawi' a 30 minute documentary airs. Martha and I are in London for the One Show and we won't get a chance to watch the documentary until it goes on iPlayer and we'll post the link to it as soon as we can. Versions of the documentary will also be broadcast on BBC World on the weekend of 20th/21st Oct and on the News Channel on the weekend of Nov 3/4. It's quite a nerve wracking day ahead of us. We'll try not to be shy and we'll tweet on @NeverSeconds as we go. I just wanted to say that I think what Martha is doing is fantastic. I used to live in Malawi in the 70's and also went back there to live at the Southern Lakeshore area in the late 80's/early 90's. Then this year I was lucky enough to go back and take my husband to this wonderful country I love so much. I saw a lot of change - a lot more poverty, so much death(mostly from Aids) - but still the people smile so much more than they do here in UK. I have been following Martha's blog while she is there and will be watching you on TV this evening. I saw a wee bit of you on Reporting Scotland the other evening and it bought a tear to my eye - I have lived and worked among Malawian people and I know the hardships they endure. I have links to a wonderful place called The Open Arms Children's home near Mangochi - I am a friend of their charity - they also do amazing work. All the best for the TV thing and just remember the smiles of the Malawian kids when you feel nervous. Martha for Nobel Peace Prize! As suggested earlier, The One Show is not on tonight in Scotland because of an extended Reporting Scotland. It can be seen in Scotland by anyone with satellite (either FreeSat or Sky) by watching another region's BBC1 or on FreeView by watching BBC1 HD which does not carry regional opt-outs. Veg's Dad - send me a message if you want copies of the two programmes on a DVD, I can easily copy to DVD if you want a permanent copy. I live in israel and my name is Tirza Hechter. I've followed your blog since April, and want to let you how much I admire your courage, your work and insights. As a scholar of digital culture and a blogger, I find your blogging so mature and your attitude toward the wellfare of others very unique. I wish you GOOD LUCK and enjoyable interviews in LONDON. Thank you for posting those videos. Pictures are great, but the videos do a much better job of showing you just how real this all is. I'm tearing up. Thank you for sharing and keep up the good work. Try not to be too nervous on TV tonight! :) Have fun - you guys deserve it. go Veg and family! so proud of you all and your efforts for Mary's Meals! What an inspiring story! When I read your blog, it's hard not to see how much you have done to change the lives of others. It's amazing. I know that your charity that you like is Mary's Meals, but have you ever heard of LifeStraw? It is a charity that donates LifeStraws(which filter water) to children in Africa. http://ucan2.org/. This is a charity that I helped raise money for last year in America. Our group of kids helping others spread across the U.S. and we won $10,000 to donate to a charity of our choice. uscsnow.org. Thank you so much VEG, you have changed the world for the better. I'm so looking forward to watching these programmes this evening, hope you're all having a great time in London. Keep up the good work Martha. Wow i think this blog and all the authors are AMAZING! Hello, I'm watching you live on the oneshow, I just want to say, Martha that you're really inspirational and at my school it is exactly the same, keep the pictures coming! I think that the amount of money you've raised is amazing! I just saw you and your Dad on the One Show, we'll done, you came across very well and you should , as Jamie said, be very proud of what you've done. PS, never mind "Gilbert for President " how about "Martha for Prime Minister" ? I've just watched the documentary on BBC1 Scotland. I don't feel I need to comment on the fabulous work being done by everyone involved in the project at Mary's Meals, including the inspirational Martha herself. I was however truly moved at the very brief scene when the children were present with a few simple gifts and backpacks, donated by children around the world. It is a harsh reminder of how materialistic our own society has become -- a few tiny, almost insignificant, items (shoes, pens, paper, a ball) can bring joy to these children. I have just watched Martha, Meals and Malawi and wanted to say you are doing a wonderful and inspirational thing for someone at a young age, it is so uplifting to see. At one point in the documentary the children were given back packs however there was one young girl who was too late and missed her chance at receiving one, I was just wondering if you know if she did receive one in the end? I am going to volunteer after my studies and can't think of a more fulfilling feeling than helping others! Starting watching the documentary 'Martha, Meals and Malawi' this morning, have about 10 minutes left to watch - but I had to leave for work. Great documentary and everyone if you can watch it. Can't wait to get home tonight and finish watching. The One Show was good, and you both did an excellent job to raise the awareness further, the donations certainly increased because of it. Shame you didn't have your Mary's Meals shirts on. I watched the BBC documentary yesterday and The One Show online today, and you were brilliant! As a Yank in Florida who has followed your compelling saga with great admiration from the beginning, I would love to see the BBC Documentary. However, it's not to be. BBC evidently still bears a grudge from our revolutionary war with you guys and won't allow BBC TV programs to be seen over here. Iplayer simply spits up and tilts in the states. Any suggestions? I have a modest one for you: If you agree to be on a show, get them to agree in writing to let you post their program/article on your blog immediately after they present it to their audience. Your story is both compelling and heartwarming and it helps them draw traffic to their various programs/newspapers/ etc. It also obviously helps to promote your Mary’s Meals cause also. So it's win-win for everyone and that way (selfishly!) I'll be able to watch too. Here's a scary thought: life might not get back to normal! Once the genie is out of the bottle - and it certainly is in your case - it may be impossible to get it back in. I agree this is all wonderful but you and your family are entitled to privacy and some semblance of a "normal life" also. It'll be a difficult balance to strike – especially after seeing in person what a difference your blog has made to the kids in Africa. Whodathunk it? Best of luck doing so and thank you for your wonderful efforts on behalf of those who need a helping hand the most. I am Aarti from India. 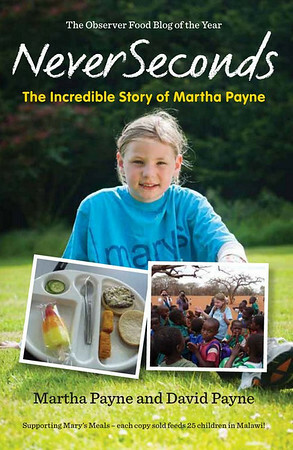 I saw the documentary Martha, meals and Malawi today on BBC. Its fascinating to see how a young girl like you is raising millions of pounds and feeding thousands of children in Malawi. Keep up the good work!! !